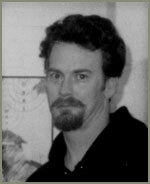 Don Drakulich graduated from Virginia Commonwealth University with a Bachelor's degree in Fine Arts in 1984. The next year Don began collaborating with GWAR and became a full member in 1986. He quickly became one of the driving forces of the band's conceptual look and direction with his introduction of spewing gore f/x as well as costume fabrication using latex and fiberglass. During GWAR's peak years, Don's contributions in performing, conceptualizing, writing, directing, editing, designing, fabrication, and graphics was varied and prodigious. While probably best known for performing as GWAR's manager Sleazy P. Martini, he specialized in creating the oversized costumes that overwhelmed the stage such as two versions of Gor-Gor as well as the Flesh Column, World Maggot, and Cardinal Syn. Don also became the Slave Pit's character artist for famous faces that gave GWAR's gore f/x their topical edge. During this time Don also served as the Slave Pit's shop foreman and the f/x supervisor until 1995 and eventually stopped touring with the band regularly in 1996. He still directs videos and fabricates f/x for GWAR while running his own sculpture, f/x and video company Hypereal Productions.